Follow Mickey as he travels across the globe with a host of friends! This uniquely illustrated search and find book depicts Mickey in various stages of his artistic evolution. Perfect for Disney fans young and old, this is a great way to celebrate the 90th birthday of the world's... read full description below. Follow Mickey as he travels across the globe with a host of friends! 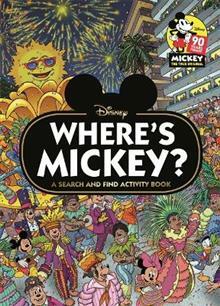 This uniquely illustrated search and find book depicts Mickey in various stages of his artistic evolution. Perfect for Disney fans young and old, this is a great way to celebrate the 90th birthday of the world's most iconic mouse!